Jumper Mango £39.99 / Leggings see below. These are the Commando faux leather leggings that I ordered from Net-a-porter this week for £110. They have since sold out, but I found them on Amazon here for £99. I ordered what Net-a-Porter listed as a ‘S/M’ but they are definitely labeled with an ‘S’ and I would say since I am a size 6/8 and they are super super tight on me, that they come up small. They look just like leather, are stretchy but very tight on. M&S Leather Boots – only size 5.5 left! These are the boots that I got months ago when I worked on an M&S must-haves campaign. They sold out completely but I noticed this morning they were back online with a size 5.5. I have ordered some hiking boot laces from Amazon to give them more of a hiking boot feel. These are the ones I ordered. 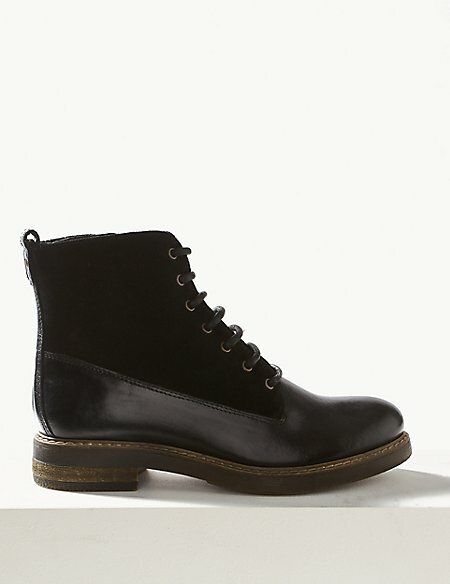 These boots dropped in H&M this week, but they sold out almost immediately. Actually scrap that, they have just this minute come back in stock in size 4 and 6.5, but I don’t think they will stick around for long. I have tried to answer all the questions that I have had by DM this week as I just haven’t found the time to answer them all individually this week. I am gearing up for another very busy week next week, so I have decided to take this weekend a little slow to recharge my batteries. I hope you manage to do the same!